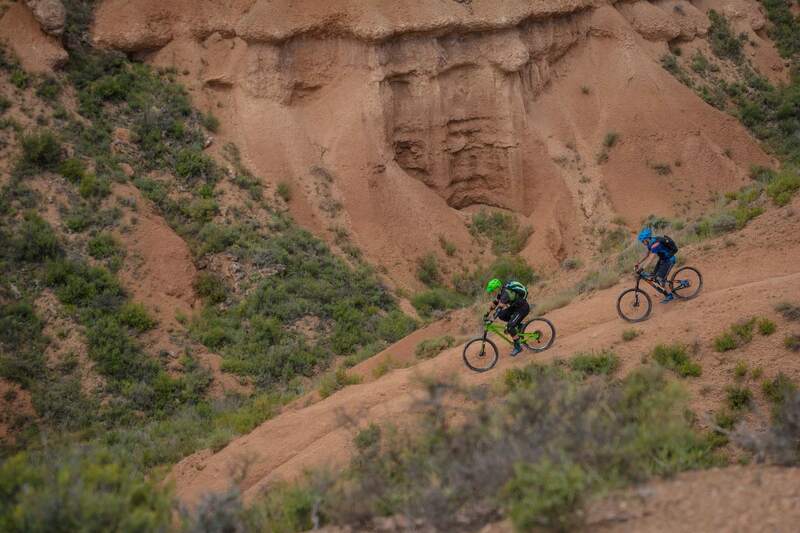 Ride red dirt trails at the Spanish Utah and two days of remote singletrack and thrilling descents at Hidden Rioja. 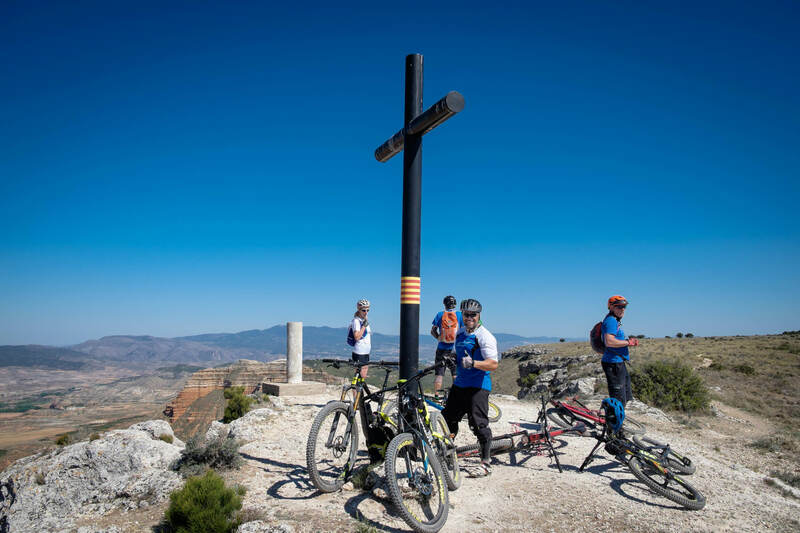 Explore Low Aragón and Rioja on a guided weekend of mountain biking. 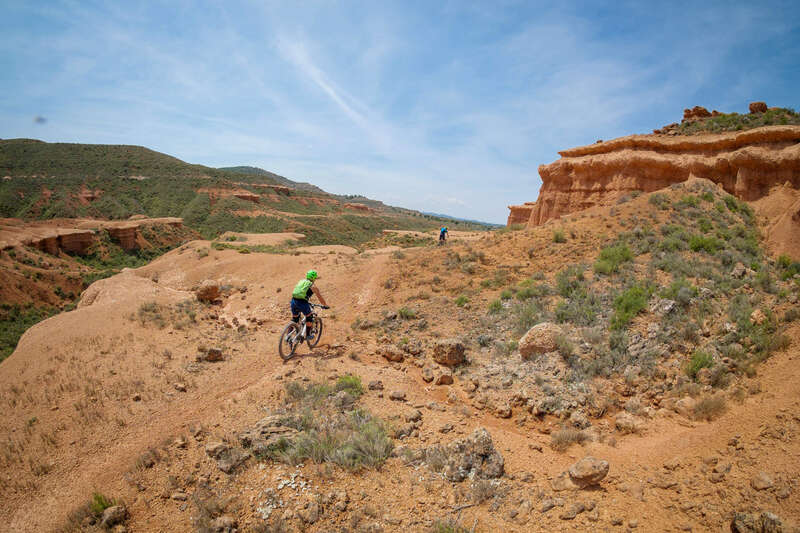 We’ll ride “The Spanish Utah”, cast and clay trails that feels like riding in Mars and the very uninhabited Hidden Rioja making a tour through villages abandoned in the 60’s and two big descents from a ridge nested stone made town. The Spanish Utah is in western Aragón close to Zaragoza. It’s a desert area formed by cast and clay from the tertiary age. It has geological formations eroded by thousands of years and it’s usually sunny with cool/warm weather. Southeastern Rioja it’s a very uninhabited area we call the Hidden Rioja, trails are only known by locals and us (of course). 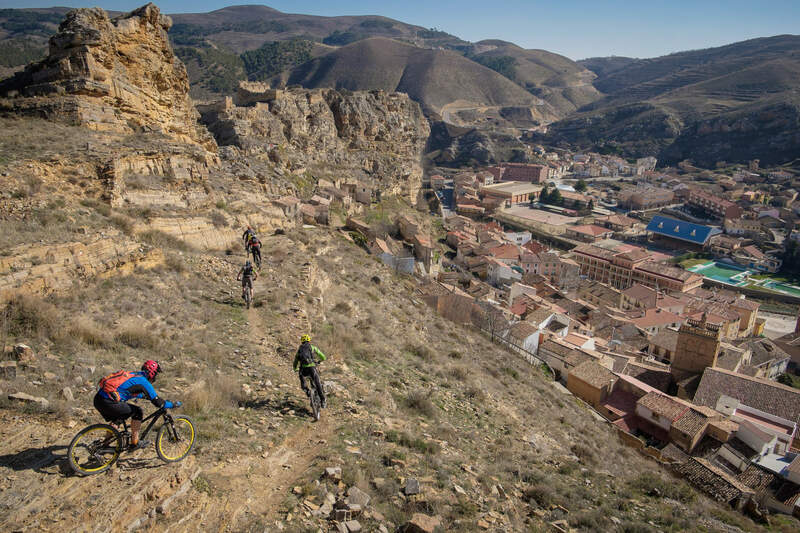 After riding many spots in Spain we were invited to ride by the hostel owner and immediately we knew it was a top mountain biking destination. 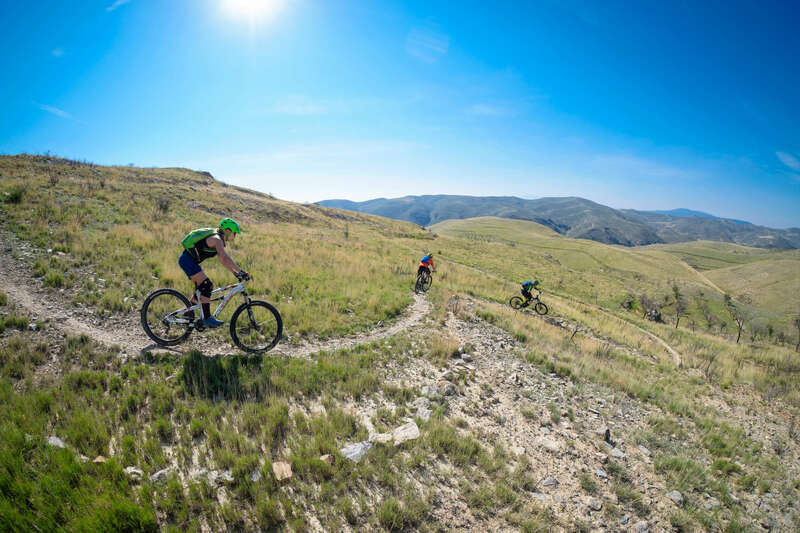 With trails meandering by alpine hillsides you’ll struggle to keep focused on the trail and not being distracted by the breathtaking vistas. Not the date you are looking for? Contact us and propose a new one, we’ll do our best. 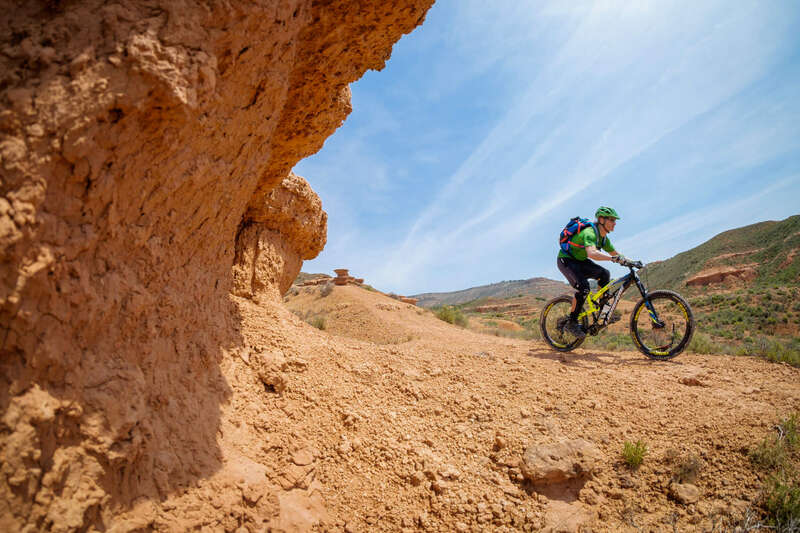 We’ll pick you up at the airport (before 10am) or hotel and drive to the Spanish Utah where we’ll have a light lunch (not included) then ride for about 3 to 4 hours. 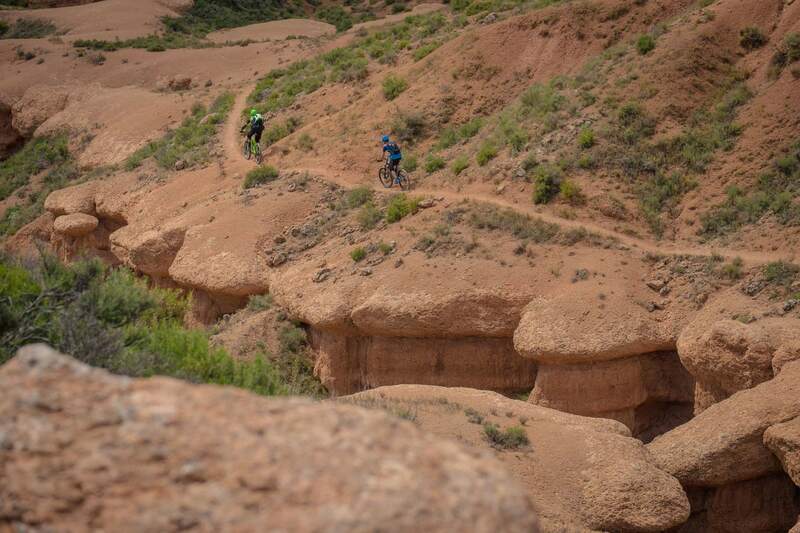 Gravel road and canyon creek climb to reach our first descend by red dirt to “Mars”. 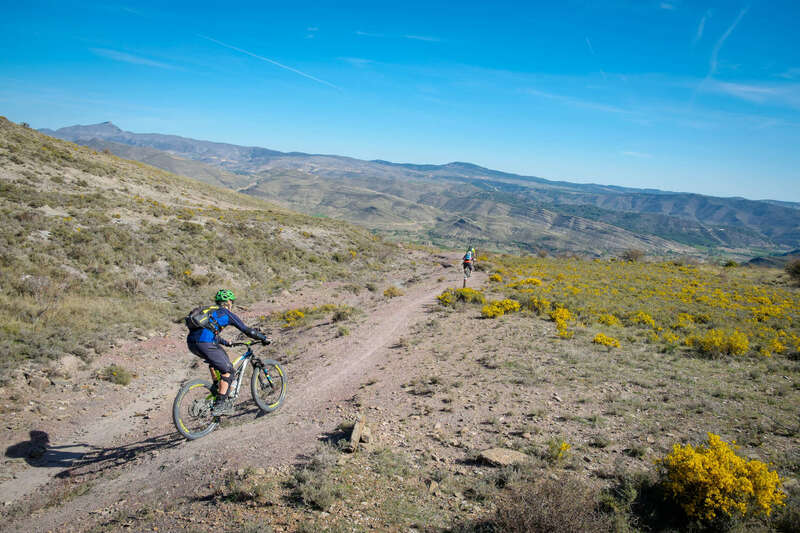 Then push the bike shortly to reach the second climb by gravel road and hike-a-bike for 10 minutes to summit a plateau from where we’ll enjoy the vistas. Short steep descent for more vistas. Down by a creek to link the final thrilling flow descent. 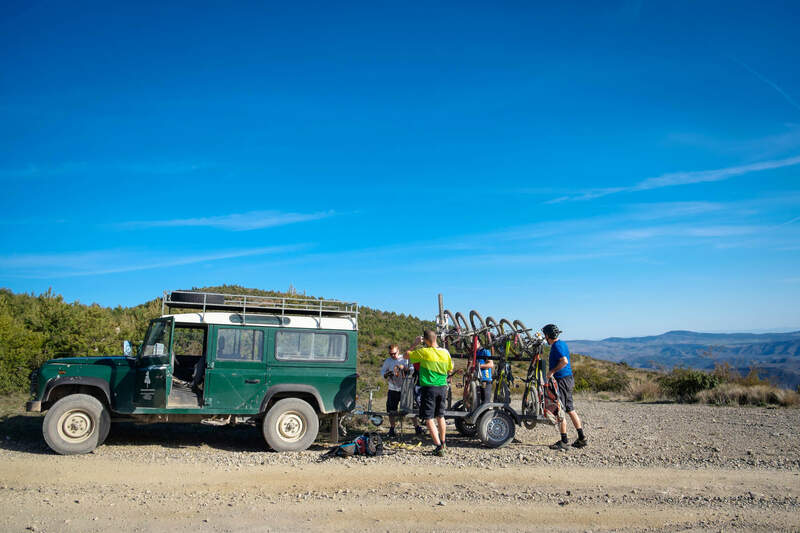 Drive for La Rioja to check in at our hostel, have dinner and brief the weekend. Driving from Madrid the Spanish Utah 2h. Driving from Spanish Utah to Igea 1,5h. 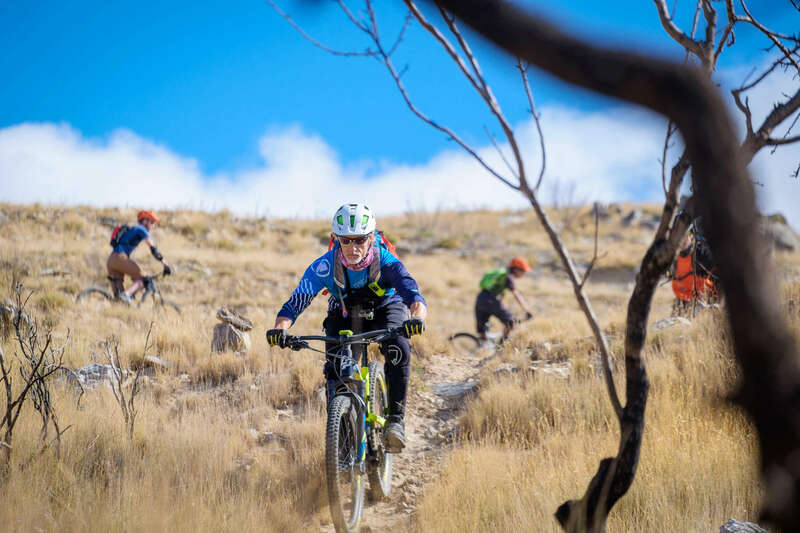 After breakfast we’ll load our bikes on the shuttle and forget about the 10km +600mts climb to start descending by a fast, flow trail along alpine terrain with 360 degrees vistas ending on the narrower singletrack we have ridden. 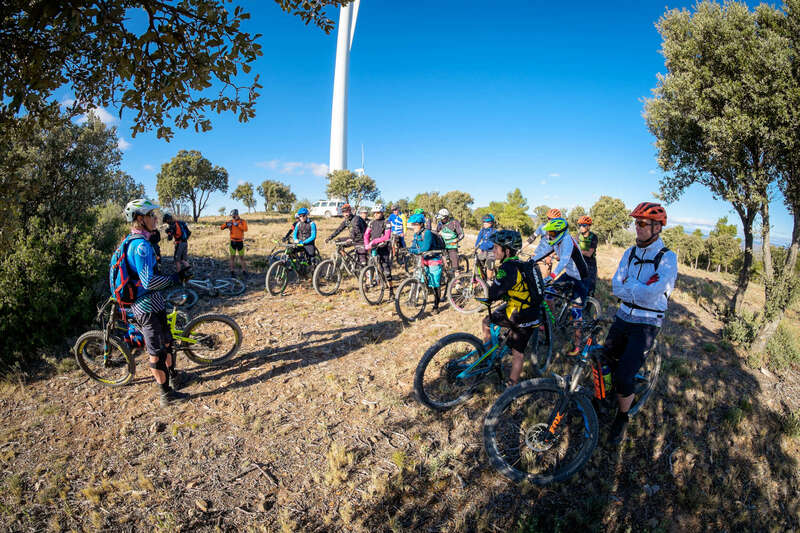 There come our first climb of the day with steep technical sections, we’ll climb for less than one hour to reach our next descent. 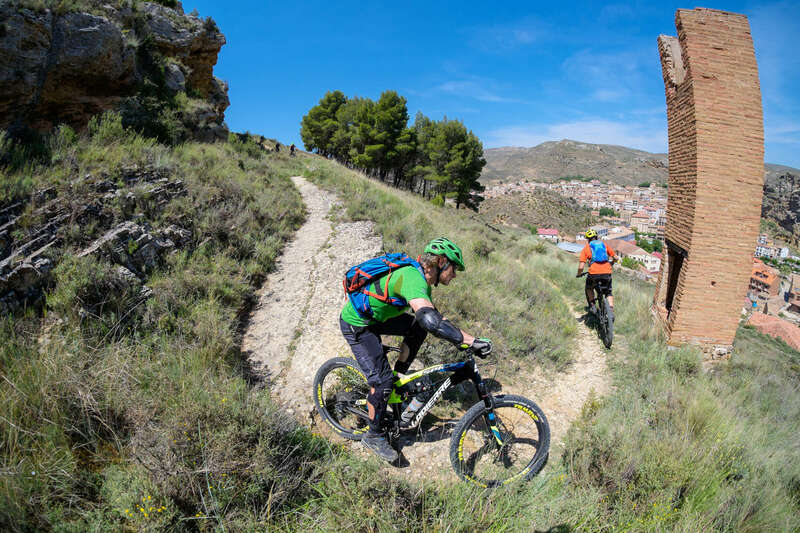 A more challenging trail with rock sections, some steps but lots of flow as we ride from one terrace to another in between almond threes take advantage of the natural berms and speed up to end on a ridge with and old castle’s ruins as we enter a village. 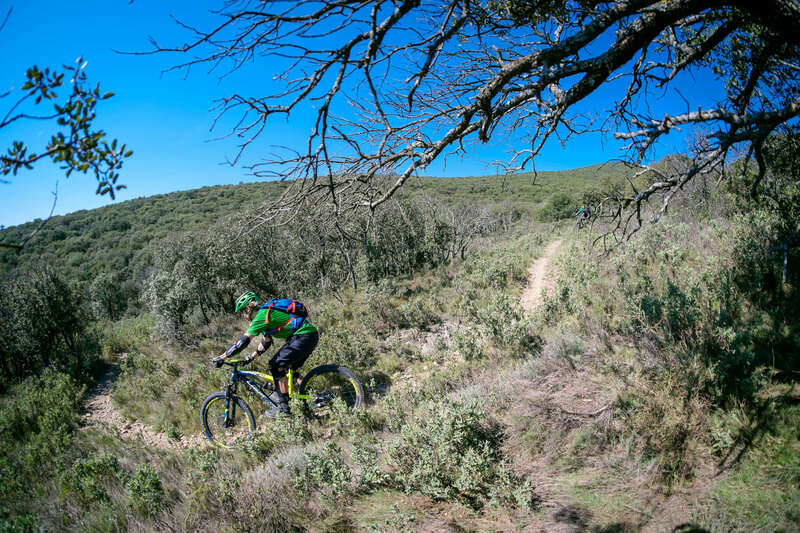 Our second climb will also take less than one hour, but be prepared for some steep sections. 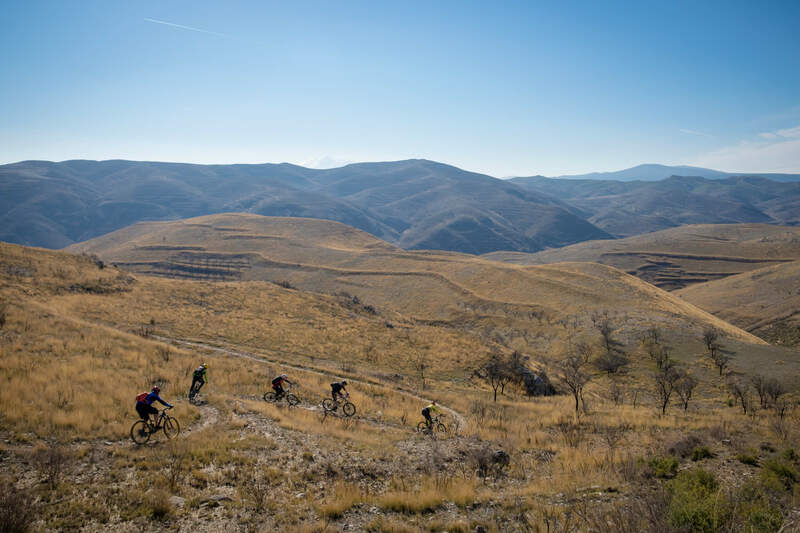 As we reach a hut we’ll be warm enough to ride the fastest and longest descent of the day, fast and flow at the beginning we’ll be soon facing some rocky sections that will challenge our speed but put a grind in our faces as we ride by the ridge line. We’ll end the morning going back to the hostel riding along a river passing by some millenary ruins. After lunch we’ll take another shuttle to ride more. Previous days might have left us tired. 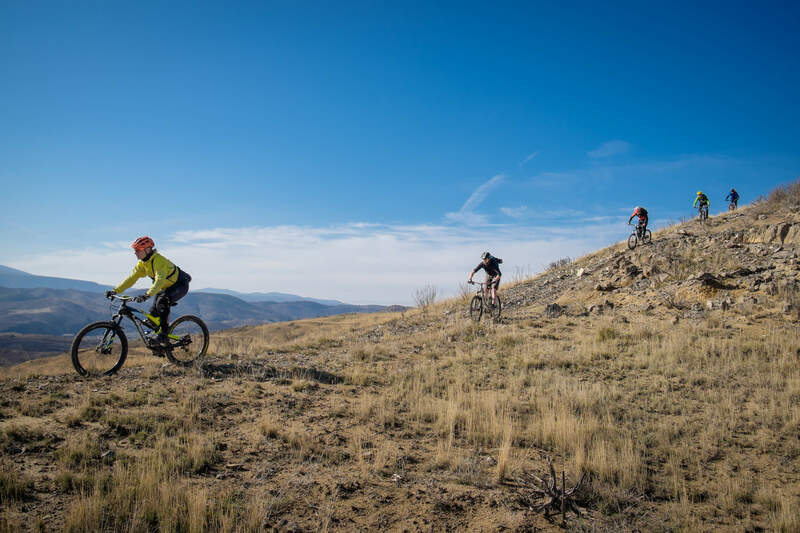 So we planned two uplifts for sunday morning to ride a couple of amazing descents through a breathtaking hillside with fantastic vistas to the sierras. 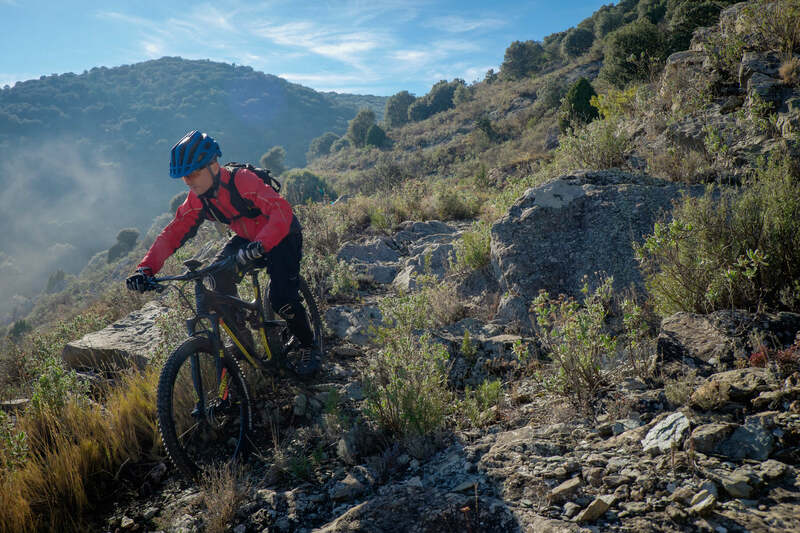 We’ll ride two alpine exposed trails starting from a stone village nested on top of a mountain. 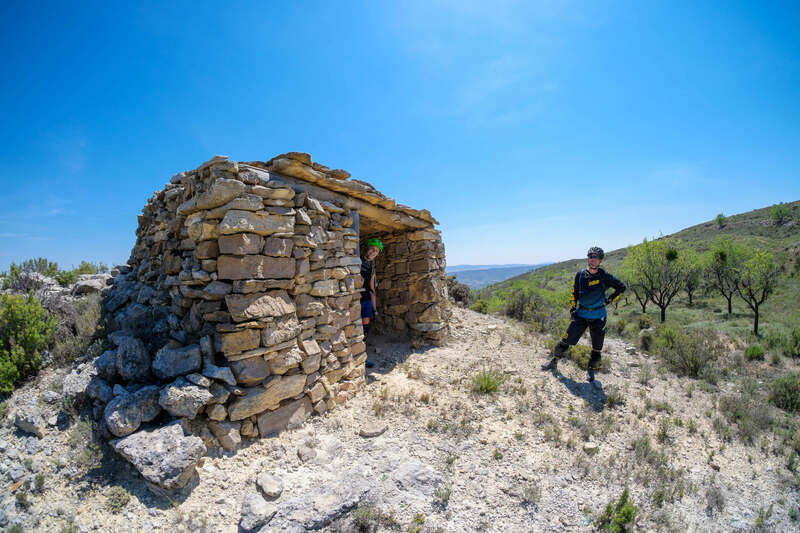 After the last descents we’ll go back to our accommodation for lunch and pack to drive back to Madrid for 3 hours. 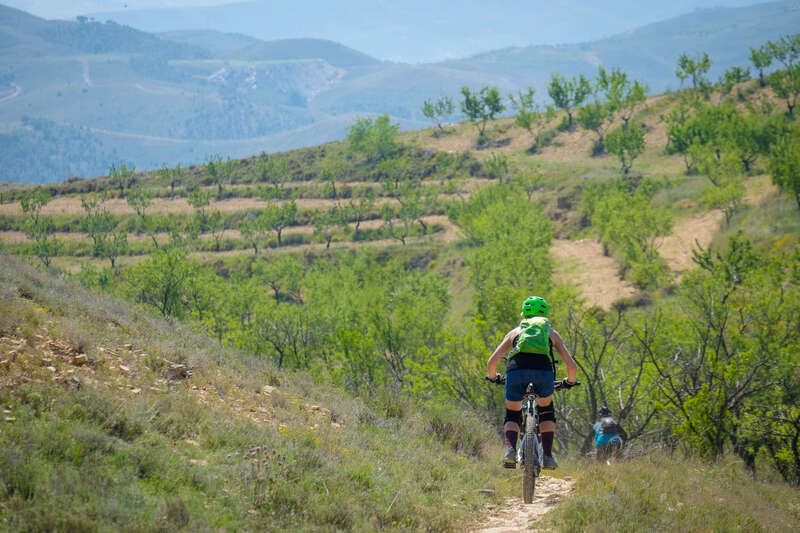 You will stay at a rural hostel in Inestrillas (La Rioja). The hostel features rooms with comfortable new bunk beds, shared bathroom facilities, hot showers and a restaurant. Double rooms upgrades are available. The hotel is fully renewed. 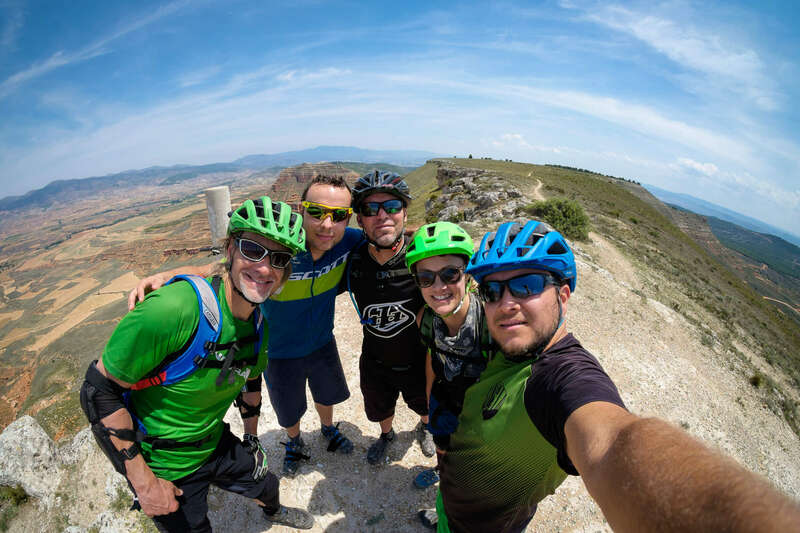 This trip is perfect for mid level to expert mountain bikers looking for an adventurous weekend exploring the hidden trails of Spain. Note: This itinerary and the duration of the activities are subject to change due to group abilities and preferences, weather conditions and forecasts, special events, etc. The hostel serves typical Spanish food. Meals center around pork products, beans dishes and vegetarian dishes are also available. Weather is very pleasant in La Rioja. Temperatures range from 10 to 25 °C and it doesn’t rains often. 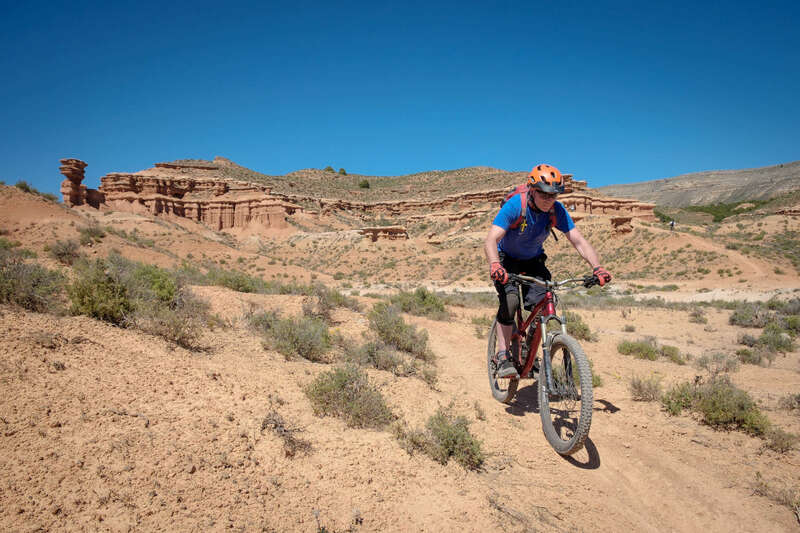 Pack your usual mountain biking equipment, as well as knee and elbow pads (the trails are rough), a light rain jacket, and a spare tube and other quick-fix repair items. You can borrow a helmet from your host if needed. + Two nights fully catered accommodation in a rural hostel. 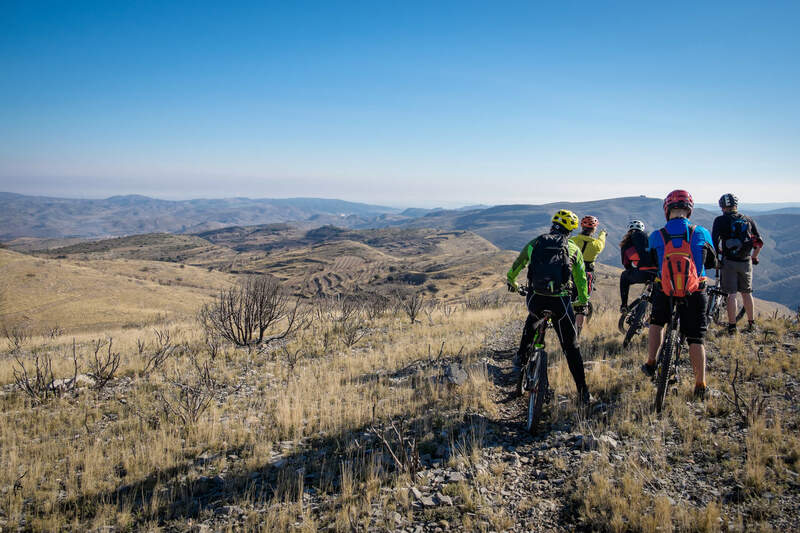 + Three days guided mountain bike riding. + All transfers during the weekend.